Or, rather, Mary, the Head Cheese in Charge over at Creating Magical Memories asked to interview me for their Creating Disney Memories feature and the post is up today! It’s always nice to get these sorts of requests in my Inbox and I was happy to answer her questions and share some pictures. A lot of people think that my site name, Scraps Of Life, is because of scrapbooking. It’s not, but I have been a scrapbooker (in the modern sense) since 1998, so it’s not like it’s totally unrelated, either. 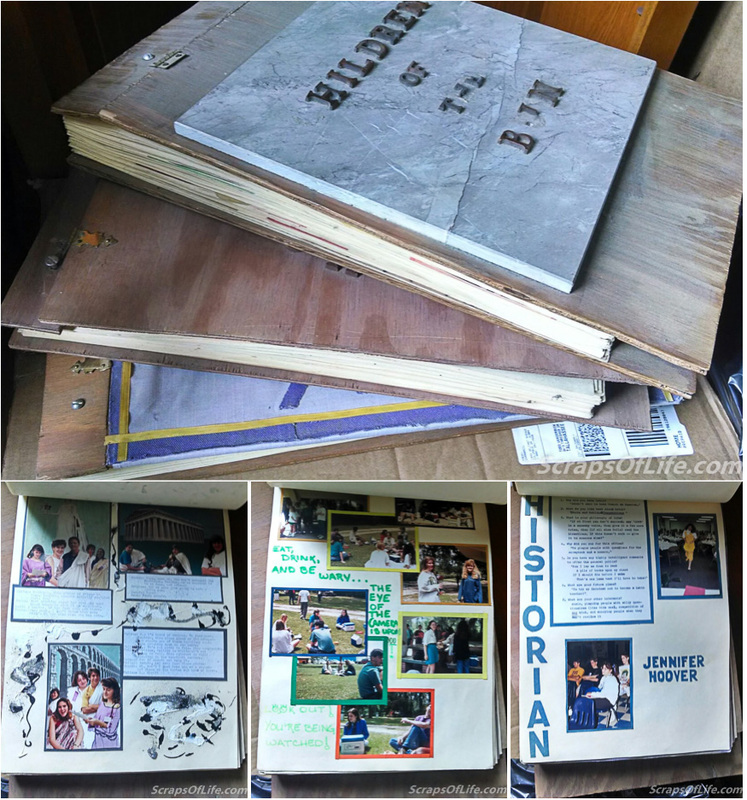 Before picking up my first scrapbooking kit, I was always saving bits and pieces of mementos in journals and then I spent time as the Historian for my high school Latin club (which included creating a scrapbook of the past year’s activities to take to the state-level competition each spring. When my Latin teacher retired a few years ago, she contacted me to see if I would be willing to take the scrapbooks for the years I was there because the new teacher would likely not keep them. She knew I’d appreciate them, so I’ve been hauling them along through the last 3 years. Yes, one has a heavy-as-sin tile on the front, allÂ three of the ones pictured have wooden covers. They’re ridiculously heavy and full of so much construction paper it makes my acid-free side cringe. The other two are more normal and still packed up from the move. One of these days I’ll start loading the pages into my scanner for posterity (and sharing with friends on Facebook, of course). I posted layouts and blogged about my digital scrapbooking before, but it’s true that I don’t make the time for it I used to. In some ways my autobiographical comics were a form of scrapbooking–well, memory keeping at least–only I didn’t have toÂ haveÂ pictures available of the events, I could just create them myself. Now that I’ve stopped drawing those, I’ve been feeling the itch to scrapbook more. The answer, I think, is to set aside some time–like a Saturday each month–just for srapbooking so that I can maybe, someday catch up on the albums that are in progress as well as the ones I’ve yet to start.